Daycare allows your dog to develop social skills with other animals in a stimulating environment while you are at work. Tail Waggin Adventures promises you to make your loved one as comfortable as possible in their doggy suite. staff member is willing to give your dog a bath. Enroll your dog in great training classes that emphasize in learning, socialization, and retention. 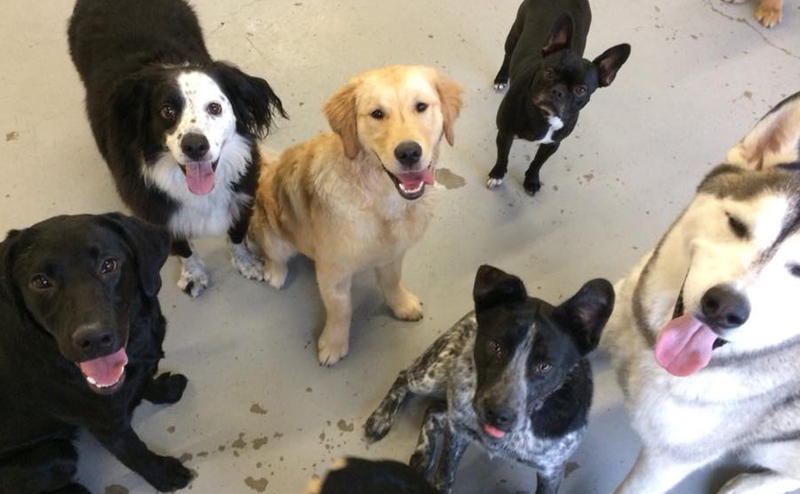 Daycare allows your dog to develop social skills with other dogs and provides a stimulating environment for them! This makes for a calmer and happier dog while you are at work, running errands, or busy with other tasks. Prior to coming to daycare your pet must complete a two-hour screening with us. This screening will allow us to evaluate your dog and make sure they will enjoy the daycare experience. Screenings are available Monday-Friday by appointment only. We require a copy of vaccination records from your veterinarian when registering your dog with Tail Waggin’ Adventures. All dogs must be non-aggressive, not food or toy protective & pass the two-hour screening. We understand some dogs enjoy afternoon snacks or meals. You are welcome to bring a zip-lock bag with treats or food (labelled with your pets name) for them while they are at daycare. For dogs over 6 months, there is a $3.00 fee for this service. Tail Waggin’ Adventures promises to make your loved one as comfortable as possible during their stay. Each dog is provided an indoor run in the climate controlled facility with raised beds and comfy blankets. We encourage owners to bring their own food so your dog’s diet is uninterrupted. We strongly encourage any dogs boarding with us to do daycare during their stay–they’ll wear themselves out and sleep through the night! Our facility has 24/7 video surveillance and security systems. On days we are closed, our kennel attendants spend time allowing your dogs to play in the yard with toys. Tail Waggin’ Adventures staff will make sure your loved one goes home smelling and feeling fresh! We offer exit baths at a reduced cost to all boarding participants and employee baths for your daycare kid. Want to bathe Fido yourself? We’ll provide the walk-in tub space, a variety of shampoos, conditioners, dryers, and brushes for your use! Nails clicking on the floor and driving you crazy? Get them trimmed! We’ll trim your dog’s nails with clippers and then round off the edge with a Dremel tool. We don’t want your pupper to stress so we will stop if they are getting too worked up then we’ll give you tips on desensitization training so we can help keep stress levels low in the future. This class is specifically for pups under 6 months of age. Puppies must have their second series of immunizations. Let’s get your puppy started on the right track! Learn techniques to bond with your puppy from the very beginning. Accurately read their body language and communicate in “puppy” language. Good eye contact and a solid recall are foundational to building a strong relationship of trust with your puppy. They are little sponges eager to learn. Along with basic obedience commands, I will guide you in connecting with your new puppy and building easy, fun, structured training sessions to enhance your bond. This class is for dogs 6 months and older. It’s aimed at training you to train your dog. The basic class emphasizes the essential training commands needed to have a great family dog: sit, down, stay in position, leave it, recall, walking on a loose leash, etc. These basic skills are important in keeping your dog safe. Taking basic obedience a step further, your dog will learn how to walk on a loose leash, down-stay at a distance, listening to commands in groups of dogs, etc. At the end of the course, your dog will know the commands and exercises needed for a Canine Good Citizen certification—an AKC certification program designed to reward dogs that have good manners at home and in the community. Rally uses basic obedience moves to navigate a course laid out with signs. Each sign represents a basic command and when used in combination can mimic real life. Some examples of commands written on signs include moving down, zig-zag walk, side step right, fast walk, slow walk, sit-stay, down, recall, etc. It’s a great way to connect with your dog and learn each other’s body language. If you are interested in competing, this is not the class for you. Tail Waggin’ Adventures: Doggy Daycare, Boarding, and Training Facility — 4481 N. SR 27 Pullman, WA — HAVE A TAIL WAGGIN’ DAY! Call 509-332-BARK for tail waggin’ fun!